Tapentadol is the first centrally acting analgesic that combines two mechanisms of action, mμ-opioid receptor agonism and noradrenaline reuptake inhibition (MOR–NRI), in a single molecule.1 The synergistic interactions between the two mechanisms provide inhibition of ascending pain signals through MOR agonism and enhancement of descending pain inhibition through NRI. The result is broad efficacy across nociceptive, neuropathic and mixed pain. Multiple sclerosis (MS) is a neurodegenerative autoimmune disorder of the CNS. Recent experimental and clinical evidence suggests the presence of microbial imbalances in the gut of MS sufferers. The gut microbiome is defined as the summation of all the microbial entities as well as their genes, proteins and metabolic products in a given space and time. Studies show the MS gut microbiome as having general alterations in specific taxa, some associated with the promotion of inflammatory cytokines and overall inflammation. 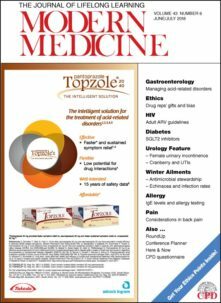 Data on the use of probiotics and supplements in children are limited; however, a definite role has been shown for probiotics in gastrointestinal disease. Dietary supplements are important in treating deficiencies and insufficiencies when a child’s nutritional status is impaired, although an optimal well-balanced diet is the best way to maintain sufficient intake of essential micronutrients. The diagnosis of allergic diseases has increased in the last few decades and allergic conjunctivitis has emerged as a significant problem, which can cause severe ocular surface disease. Patients complain of itching, watering and redness. It can result in decreased quality of life, as patients with severe symptoms, if left untreated or treated poorly, may become school dropouts, unable to work outdoors and sometimes fail to sleep. The symptoms are aggravated by exposure to dry and windy climates. Paroxysmal or permanent atrial fibrillation associated with a CHA2DS2-VASc score of one or more for men, and two or more for women should prompt consideration of anticoagulation to reduce stroke risk. High-risk patients with atrial fibrillation remain significantly undertreated. Older patients, despite having a high risk of falls, are nevertheless likely to benefit from anticoagulation. Perioperative bridging anticoagulation for patients with atrial fibrillation is not routinely recommended. Direct oral anticoagulant drugs should be ceased 24 to 48 hours before procedures. Asymptomatic carotid atherosclerotic disease should be treated medically. Antiplatelet medication for secondary prevention has most benefit when given early after stroke or transient ischaemic attack. A substantial percentage of people with no history of depression become depressed after a heart attack or after developing heart failure. People with depression,with no previously detected heart disease, seem to develop heart disease at a higher rate than the general population. 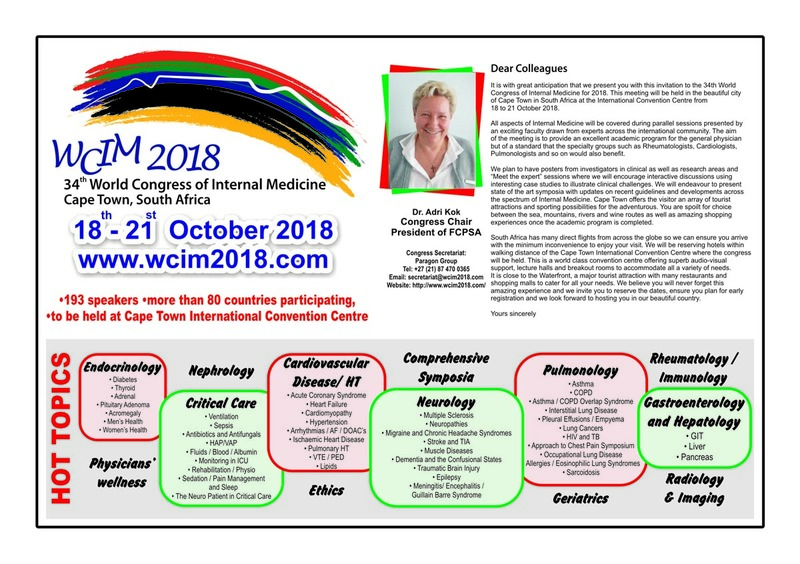 Modern Medicine invites you to attend the World Congress of Internal Medicine (WCIM) that is coming up in Cape Town at the end of October. We look forward to seeing you there! Click on the above image to find out more.